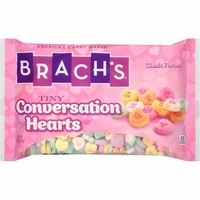 Brachs small conversation hearts are a traditional Valentine's Candy. Tiny pastel hearts with messages of love. Hug Me, Be Mine, Cute, Love You are just a few of the love messages found on these small candy hearts. Valentine's day just would not be the same without having a bowl of these candy hearts sitting on your coffee table or desk. They are not only tasty just to eat, but you will often see these on cupcakes or cookies. These are the new flavors.